Have some fun with bean bags! We have four colours of bean bags so we chose four coloured chalks to match. We drew four different shapes and numbered them 1 to 4. Then it was time to play. Have a go at colour matching – can you throw the blue bean bag into the blue shape? 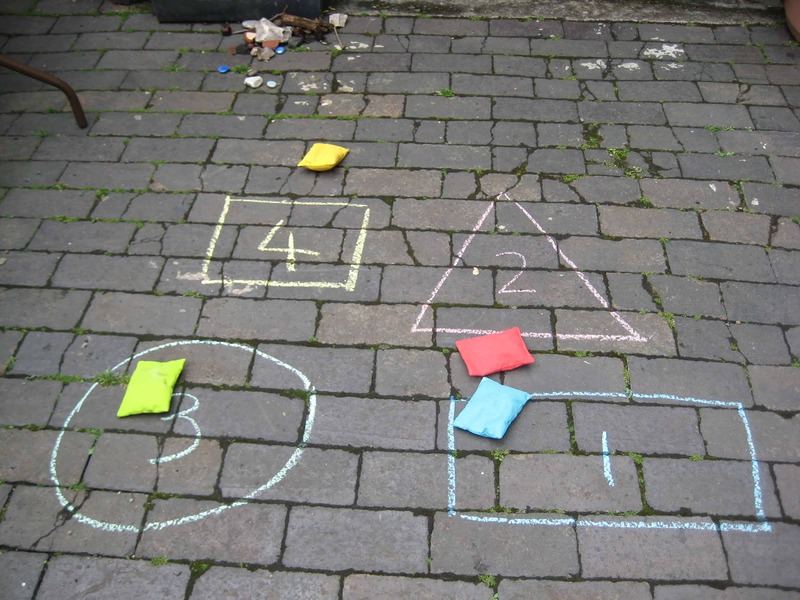 Have a go with numbers – can you throw a bean bag onto the number 1? onto the number 2? 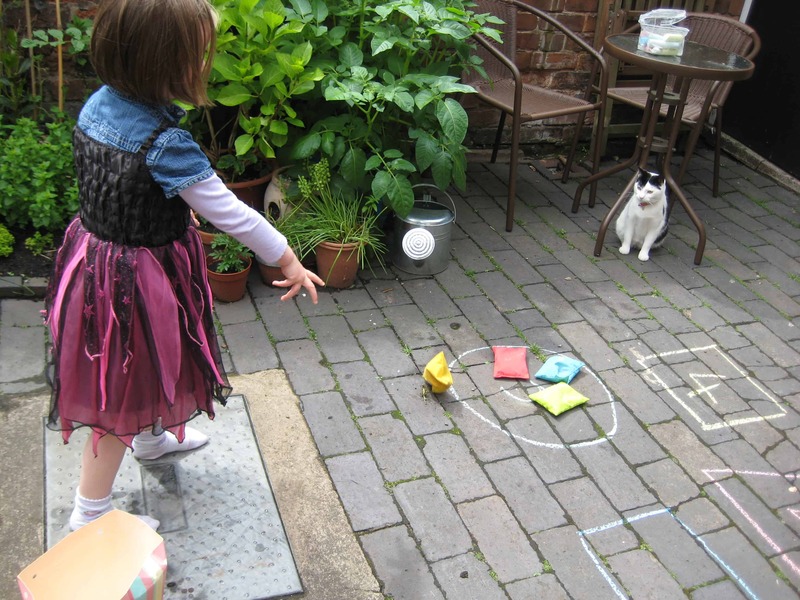 Have a go with shapes – can you throw all the bean bags into the circle? 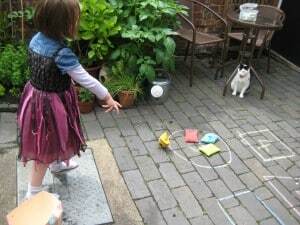 With older children you can let them throw at the targets and add up the scores as you go along. Sometimes I wonder if we are living paralle lives, we have been hotscotching! 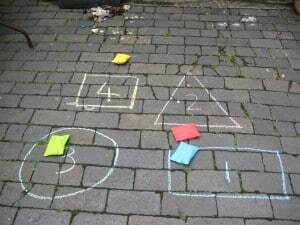 @TheMadHouse I think that often 🙂 we had hopscotch on that day too! I love your fun and simple ideas. Thank so much for sharing them with us! That looks like fun. I think I’ll have to try it with my 2 1/2 year old. That is a lovely idea. I have done similar things but I have never combined colours, shapes and numbers into the one experience. Thanks for the inspiration. What great, totally do-able, ideas. I appreciate all the different ways to learn various skills with simple materials. Thank you for sharing your ideas and for linking to ABC and 123. My boys love anything I say is OK to throw around! Great idea. Bean bags are such fun, but believe it or not, we have never used ours outside! Guess we should, as it looks like fun. Now, I think we have some bean bags hidden away in our storeroom somewhere – I’ll have to hunt them out! Great idea. 🙂 I’m so going to be borrowing that. This would be great with the bean bags Christie did a turtorial on at Childhood 101. Simple fun learning. So good : ) Thanks for sharing. Very nice. I need to make some bean bags for my kids; thanks for the reminder!